The Hopi Prophecy warns others about consequences of their actions and provides details of signs of changes to come. An ancient Hopi prophecy states, "When the Blue Star Kachina makes its appearance in the heavens, the Fifth World will emerge". This will be the Day of Purification. 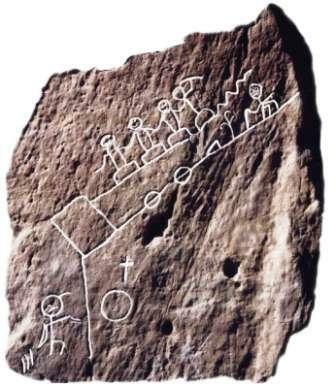 The above picture is of an ancient Petroglyph on the Hopi Reservation in Oraibi, Arizona that describes the life path of the world. Hopi Prophecy. Discover the vast selection of pictures which relate to the History and Culture of Native Americans. The pictures show the clothing, War Paint, weapons and decorations of various Native Indian tribes that can be used as a really useful educational history resource for kids and children of all ages. We have included pictures and videos to accompany the main topic of this section - the Hopi Prophecy. The videos enable fast access to the images, paintings and pictures together with information and many historical facts. All of the articles and pages can be accessed via the Native Indian Tribes Index - a great educational resource for kids.